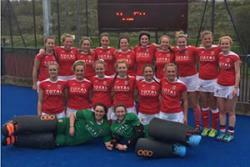 The Welsh Universities Hockey TeamTen Bangor University female students were recently selected to represent the Welsh Universities Teams in the Home Nations competition. After a five year break, the Home Nations, a sporting competition where university students represent Wales, England and Scotland, made a return and was hosted by the University of Edinburgh. This year’s event saw teams compete in Men’s and Women’s Football, Men’s and Women’s Hockey and Men’s and Women’s Rugby 7s. The Welsh teams were selected from across Wales’ universities, ten of which were from Bangor University. Selection for the Welsh Universities team represents a significant achievement and is often the pinnacle moment in a student’s sporting career. The students selected for the Welsh Universities Hockey team were Bethan Ellis, Lois Evans, Celina Hacket, Beth Kenny and Meghan Wharton. 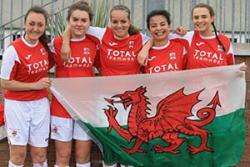 L-R: Jemma Parfitt, Mari Gibbard, Keren Allen, Jo Bramwell and Elizabeth Neatherway - selected for the Women's Football TeamThe students selected to represent Welsh Universities in the Women’s Football tournaments were Jemma Parfitt, Mari Gibbard, Keren Allen, Jo Bramwell and Elizabeth Neatherway. This achievement culminated a fantastic year for Bangor University Women’s Football as they won their BUCS football league (Division 2A) and also the BUCS futsal league (Division 1A), they beat Aberystwyth 8 – 0 in Varsity and also enjoyed good cup runs in both Football and Futsal resulting in achieving the highest scoring BUCS points team at Bangor University in 2016/17.